Tim Krul returns to action next week braced for the battle to win back his number one shirt – and put Newcastle United back in the fight for European qualification. Launching the club’s new home kit yesterday, Krul confirmed that he will play his first match for three months at Ibrox on Tuesday. It is a welcome return to first-team duty for the Holland goalkeeper, who ended an injury-jinxed season by dislocating his shoulder in the Tyne-Wear derby in April. In the midst of another day of inactivity on the transfer front, it is also a major boost for Newcastle boss Alan Pardew to have one of his most influential players back and motivated for the start of a new campaign. Krul is ready to put months of misery behind him at Ibrox, and kick-start both a personal renaissance and a black-and-white recovery. “I can’t wait to get back. I’ve had a three-month spell out and it’s been one of the hardest things I’ve done,” he told The Journal . 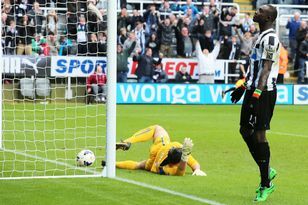 Krul now wants to concentrate his efforts on wresting back his number one status from Rob Elliot – and making sure Newcastle are competitive. “We are a better team than what happened last season. We have to take one game at a time but it would be great to finish where we did two years ago. “I don’t want to look too far ahead but we’re capable of that. “Personally I’m looking forward to next season and I’m pleased that Rob did well when I was injured. Understandably, Krul did not want to be drawn on the lack of transfer activity at St James’ Park, which remains top of the black-and-white agenda. After United’s efforts to recruit Darren Bent were thrown into disarray by the terms of the deal quoted by Kinnear in a meeting on Wednesday, they were also warned to think again about their pursuit of Loic Remy. It has emerged that Newcastle had asked Bent to wait until the final week of the transfer window, when they would launch a bid of around ï¿½2m to try to bring him to St James’ Park. Bent’s unimpressed advisers now seem ready to talk to Fulham, despite the player having apparently favoured a move back to the North East. Having spoken to the player’s advisers twice this week, Newcastle believe they are close to brokering a deal for the France striker, but QPR manager Harry Redknapp ruled out a loan move in his pre-match press conference yesterday. He said that only triggering Remy’s £6.8m buy-out clause would tempt the R’s to sell. “I don’t think he will go on loan,” the QPR boss said. “I can’t see any sense in it. I don’t know why we’d pay £8m and then loan him out. TIM Krul was launching the new Puma kit, which will be available from the club store on August 22. For more details, go to nufc.co.uk.